 A formulaic, if impassioned, Rx by the executive director of the Association of American Physicians and Surgeons, whose answer to runaway medical costs and uneven care is to put patients, not health care managers, back in the driver's seat. 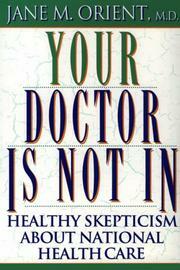 Jane M. Orient is an LMD, a local medical doctor, who practices internal medicine in Tucson, Ariz. Her irreverence towards the establishment is implicit in her definition of an LMD, ``a term of derision used by significant persons such as full professors to refer to doctors in the world outside the academy. The term connotes a bumbler or hick who somehow got an M.D. degree.'' Orient takes money only from patients, not from third- party payers. Because she's chosen to be independent from managed care networks, she is increasingly a ``superfluous woman,'' i.e. her medical opinion doesn't count. Orient compares the state of American medicine to that of an overmedicated patient, one suffering toxic effects from drugs prescribed to regulate conditions that were best left alone. Her answer is decentralization. ``Medicine,'' she argues, ``is based on the doctor-patient relationship founded on the Hippocratic Oath--not on an administrative flowchart. Remember, you can fire your doctor if you like. You can't fire your bureaucrat.'' Orient reviews the pros and cons of the British, Canadian, and German health care systems, as well as the AMA's practice guidelines, and concludes that a free market is the best alternative and the one that does the least harm. In a final chapter called ``Getting It Right,'' she issues her own plan: (1) restore insurance, as opposed to a system of managed care, (2) decrease government regulation, and (3) encourage charity to the poor. A conservative argument against increasing government regulation and bureaucratization of American medicine in the tradition of such free-market thinkers as Milton Friedman.